Lavina electric concrete grinders feature forced belt-driven planetary movement, which allows you to continue polishing under nearly any circumstance, even if a drum belt breaks. Just take the belt out and continue working, saving you time and hassle. Security features are a large part of the new X-Series. 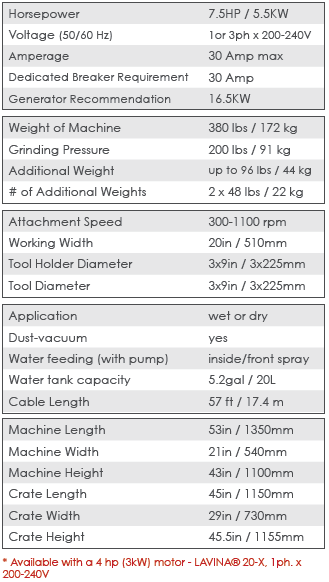 The Lavina concrete polishing machines have a security plate that will keep a fallen head or tool from coming away from the machine, resulting in a safety hazard.The Lavina concrete grinding X-series features a completely new water system that will not clog, and does not need cleaned half way through the polishing process. The water system also allows the operator to choose between internal spraying or spraying in front of the machine. All LAVINA® 20 machines are now with forced belt-driven planetary movement. Machines feature a completely new nozzle-free, anti-clogging water spraying system. A new power cable attachment connects to the top of the machine near the handle, allowing the operator to easily remove the plug and cable when work is complete, for added security on job sites. Machines are equipped with an upgraded belt tensioner, a belt inspection cover, and a new belt replacing tool. The light is now hardwired directly to the machine. Click the button below to add the Lavina 20-X and 20N-X Grinder to your wish list.